Open to RAL Members and Non-Members. The Rehoboth Art League is seeking a practicing artist to create a mural for the City of Rehoboth’s Convention Center. The Convention Center, which reopened in 2018 next to the new Municipal Building on busy Rehoboth Avenue, hosts a wide variety of groups and gatherings year-round. 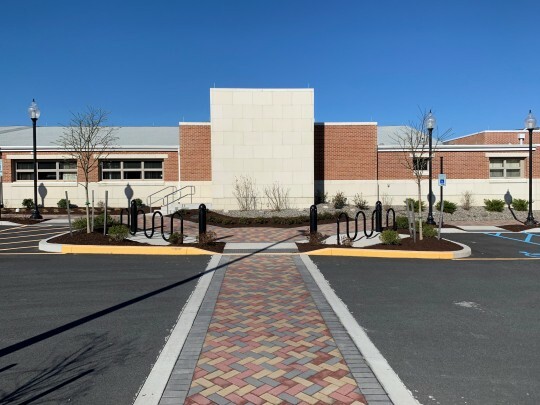 Inside the buildings, the City hosts rotating exhibitions of artwork, from the Rehoboth Art League, Coastal Camera Club, and others, and would like to continue its support of arts in public spaces with a mural on the outside of the building. The mural will have a prominent place on the Convention Center and will be visible from the well-trafficked Baltimore Avenue approach to the building. The area, which is made of cement block, is adjacent to the entryway to the Center. The mural will represent the coastal living for which Rehoboth Beach is known, and could include local landmarks, nautical creatures, or coastal scenery, among other things. There will be a $5,000 stipend for the completion of the mural, and the artist will be responsible for all site preparation and necessary materials. The selected artist could begin work on the mural as early as September 2019. The basic wall is 15’ 8” wide by 16’ tall. There is an 8” band around the top and 22” band along the bottom. So, the paintable area from the ground to the top would be 18’ 6” x 15’ 8." Interested artists should submit at least 2-3 examples of past murals, a biography or resume, and a proposed design based on the photographs of the site by June 1, 2019. Applicants must submit up to three images of past mural work plus one image of proposed design based on the Convention Center wall. Submission images must be less than 4MB each. Upon each submission, you will receive an email confirming that your image has been received. You may re-enter the call until the deadline to delete, change, and/or edit your submissions. Check out this instructional video to resize larger images using both Mac and Windows operating systems. USE THE MENU BAR AT THE TOP OF THIS APPLICATION TO REGISTER AND LOGIN.